Everyday, approximately 1.5 million vehicles ply the PLUS expressways, comprising the North-South Expressway (NSE), the New Klang Valley Expressway (NKVE), the Federal Highway Route 2 (FHR2), the ELITE highway, the Secondlink, the Seremban-Port Dickson Highway (SPDH), the Butterworth-Kulim Expressway (BKE) and the Penang Bridge. PLUS' main objective is to provide a safe, smooth and comfortable journey for its users and the PLUS Traffic Monitoring Centre (TMC) plays a vital role as the traffic management hub for the PLUS expressways. With this in mind, PLUS has invested heavily to develop its new TMC in Subang which commenced operations in November 2008. 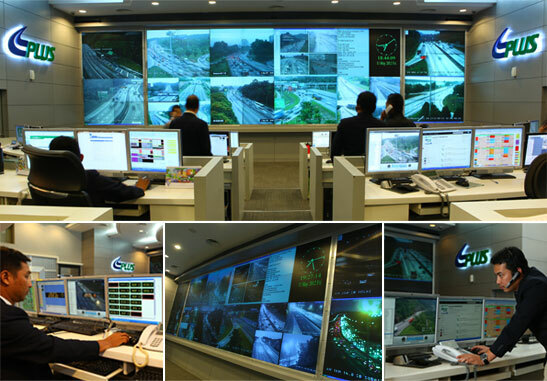 Dubbed as the most sophisticated traffic monitoring centre in the country, the TMC operates 24-hours everyday and covers more than 60% of all tolled highways in the country. The development of the new PLUS TMC is part of PLUS' efforts to provide better level of service. PLUS TMC manages more than 200,000 calls a year, with 45 to 75 operating staff on duty at the centre on a daily basis. The Centre's main function is to collect and disseminate real-time traffic information for efficient traffic management as well as co-ordinate assistance for highway users who need it. Manages the 1800 88 0000 (PLUSLine) and Emergency Telephones. Monitors movements and operations of PLUSRonda vehicles. Manages the Intelligent Transport System (ITS) equipment such as Variable Message Sign (VMS), Automatic Vehicle Detection System (AVDS), Close Circuit Television (CCTV) and Global Positioning System (GPS). Disseminates traffic information to users through radio stations, electronic message boards (VMS), the PLUSLine and the PLUSTrafik Twitter service. Liaises with the relevant authorities (Police, Fire Departments, Ambulance and others) and provides tow truck service for faster incident/breakdown clearance on the mainline. To provide the best service to the highway users, the TMC applies state-of-the-art systems and equipment from various countries such as the United States, France, Belgium, Switzerland, Germany and others.